Whilst I can't help but disprove of the mercenary manner of Jack Harris, nor the degrading descriptions of some of the women and the advantage taken of those with possibly no other course open to them. The books also offer a fascinating, sometimes humorous and detailed glimpse into life of the time and the changing of public opinion toward the trade, as evidenced from the complaint in the 1789 edition "Why should the victims of this natural propensity ... be hunted like outcasts from society, perpetually gripped by the hand of petty tyranny", continuing: "Is not the minister of state who sacrifices his country's honour to his private interest ... more guilty than her?". 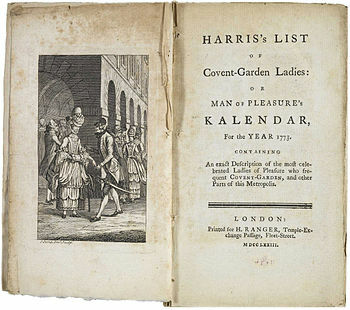 Some estimate that up to 10% of the population (both male and female) worked in the business and, despite outward appearances, the books are evidence that it was an accepted occupation (at certain levels) with the rich and famous often mentioned by Harris, George III's brother The Duke of York, James Boswell, Ernest Augustus I of Hanover, the clergyman William Dodd, Charles James Fox, George IV, William Hickey, Francis Needham, 1st Earl of Kinmorey, Robert Warpole and others.